Evidence of perfume (per fumare, or "through smoke") dates back 7,000 years to Syria, where small vessels made of gypsum, chlorite, and ceramics have been unearthed. Hieroglyphics tell us that the Egyptians made perfume as early as 3,000 BC for worship, sacrificial offerings, and entombment. Kyphi is an especially revered form of incense from ancient Egypt. Made with myrrh, calamus, cypress grass, wine, honey, raisins, mastic, cinnamon, and juniper, parts of the original recipe have been lost; but approximate recreations are still made today. "Perfection" carved in agarwood. 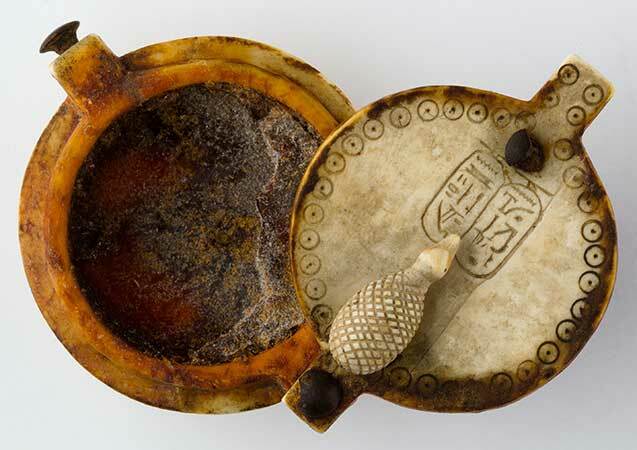 Various forms of aromatic woods were burned as sacred incense throughout east Asia. In particular, sandalwood and agarwood developed a legendary reputation. Agarwood, aloeswood, or “oud” remains among the world’s most coveted fragrant materials and is equally if not more expensive than gold. In addition to their incense, Egyptians are famous for aromatic unguents: oil-based perfumes used for medicinal, pleasurable, and sacred purposes. These were stored in ceramic, glass, and alabaster containers. 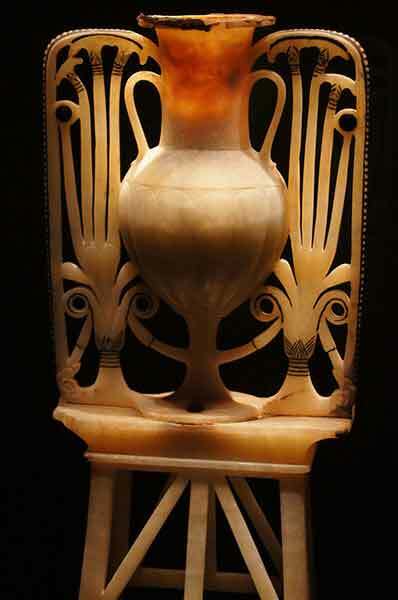 Below are several beautiful examples of unguent vessels found in tombs. Strangely, numerous Egyptian paintings depict people with dome-shaped objects on their heads. These are believed to be unguent cones made of beeswax, plant oils and/or tallow, and scented with henna, myrrh, and cinnamon. The fragrant cones would slowly melt, adorning the wearer's hair, skin, and clothes with a perfumed oil that protected them from the arid climate and repelled insects: essential self-care practices in early Egypt. 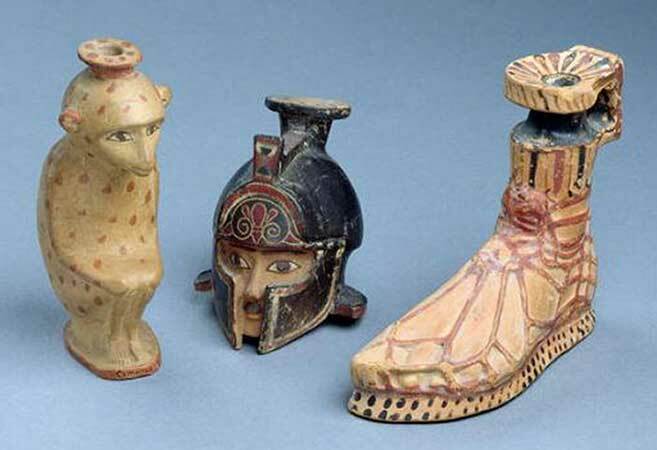 The earliest intact residue of perfume comes from Cyprus, where archaeologists unearthed 4,000 year-old ceramic jugs containing scented oils. Scientists were able to identify the ingredients as ben oil, anise, pine, coriander, bergamot, almond, and parsley. The multitude of jugs and alembics suggests a large-scale production of perfume in ancient Cyprus. The world’s first identifiable chemist and perfume-maker was a woman (!) named Tapputi Belatekallim, an over-seer of a palace in Mesopotamina. She and a female assistant are recorded on a cuneiform tablet dating to 1200 BC. The tablet describes some of Tapputi's methods to extract scent from plant material, including solvent extraction, distillation, and filtration. Corinth and later Athens revived perfume-making in Greece, concocting herbal, floral, and resinous fragrances that were used extensively by both sexes for hygiene and romance. With increased trade, demand grew for a broader palette of aromatic materials. Routes connecting Rome, Greece, Egypt, Africa, Mesopotamia, and India distributed exotic ingredients to patrons far and wide, including rarities such as musk, ambergris, agarwood, and frankincense. Woods and berries were prized in arid climates, same as frankincense was desired in humid areas. 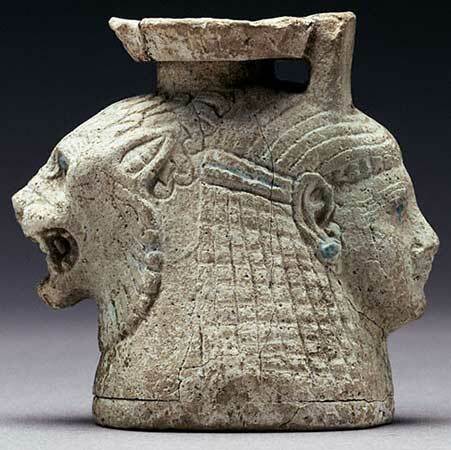 In the middle to late Bronze age, oil-based perfume was manufactured in Egypt for export to Rome. One of the better known fragrances was made in Mendes using myrrh, cassia, and cinnamon steeped in ben oil (a mildly fragrant carrier with a long shelf life). Some vendors added sweet wine to lighten the scent. A second popular perfume from Egypt, known as “Metopion,” contained galbanum, bitter almonds, unripe olives, cardamom, calamus, honey, wine, myrrh, seed of balsamum, and turpentine resin. Stakte, Cyprinum, and Susinum were other commonly known and well-loved Egyptian formulas. The winds were lovesick with them…"
At the Virginia Perfume Company, all of our Field to Fragrance® perfumes are inspired by the art and ingredients of ancient perfumery. Given the heavy spices, resins, and woods that characterize Egyptian perfume, I would choose "Tabac" as our most ancient-smelling fragrance. It contains an absolute of tobacco leaves (an American plant, but one with a resinous, woody, and honeyed scent), labdanum (also known as the resin of Cistus), cinnamon, east Asian agarwood, Moroccan rose absolute, Indian sandalwood, African copal bark, birch tar, Chinese musk, and clove. Tabac smells like the inside of an old tobacco shop, which bears some olfactory resemblance to an ancient temple: deep, dark, fragrant with woody incense, and sacred. Here ends my overview of ancient perfumery. In my next newsletter, I will continue the story with fragrant tales from the Judeo-Christian tradition. I hope you’ve enjoyed reading about perfume in the ancient world. Please join our mailing list to be notified of future articles on the ingredients, artistry, and methods that make perfumery a wonderful experience for the senses. Review our perfumes and like us on Facebook!